Anthony Barton's second growth is always a top quality Bordeaux of classic proportions. Structured, Cabernet Sauvignon dominated wines are produced here that are serious, controlled and pure. The 50 hectare vineyard is planted 74% Cabernet Sauvignon, 23% Merlot and 3% Cabernet Franc. Always the epitome of Saint Julien and the ultimate "Englishman's Claret". 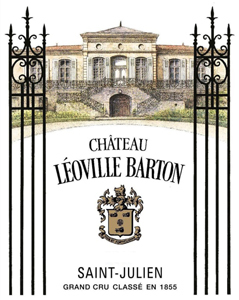 One of the few truly exceptional Left Bank wines of the vintage, the 2017 Léoville-Barton is simply fabulous. The 2017 also has the distinction of having a very high percentage of Cabernet Sauvignon. Inky crème de cassis, white flowers, lavender, crushed rocks, menthol and spice give the 2017 a distinctly layered, resonant feel. The 2017 offers fabulous density and structure, although the tannins need time. The blend is 93% Cabernet Sauvignon and 7% Merlot. The September rains were especially challenging for the Merlot and Cabernet Franc. As a result, Cabernet is pushed up in the blend, while there is no Franc at all. Tasted two times. Deepest crimson. Dark, savoury and spicy black fruit with a lovely balsamic note but also a light vanilla sweetness and a more subdued graphite layer. Complex already. On the palate, this is succulent, firm but polished. Tannins are very fine, definite. A harmonious whole and a juicy finish. With 93% Cabernet Sauvignon and 7% Merlot in the mix, this is the most strongly Cabernet wine ever produced here. Picked 15-29 September with maturation in 60% new oak. A deep and brooding nose of cassis with a hint of dried violets and smoky liquorice. The palate is richly tannic but ripe. This mouthcoating structure provides an ample frame for pure cassis and cedar. This wine has great delineation of fruit and supreme elegance, but still the power and ripeness to linger with lightly exotic spices of nutmeg and clove on the finish. Rather more structured than Langoa, as usual, but also a little more feisty, dense and rather more tannic and active on the palate, too. There is the traditional cassis theme and the tannins and oak are not dominant, allowing the fruit to expand and develop during the experience. There is some tension with the tannins but they do not shut the wine down as I have seen in other properties. I expect it to age slowly and incrementally, waiting some time before it softens - perhaps a decade or more.